BRP's (TSX: DOO) 100,000th Can-Am Spyder rolled off the assembly line on April 20. 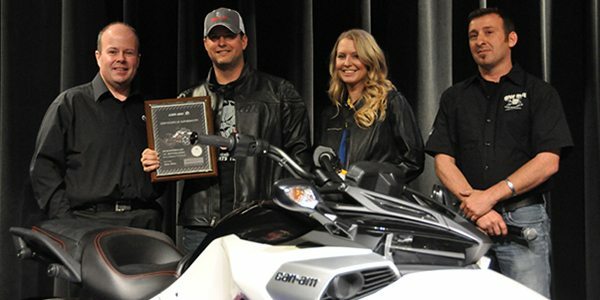 BRP and Pit Bull Powersports, the local dealer, presented the autographed vehicle, a 2015 Can-Am Spyder F3-S, to its new owner, Missouri firefighter, Brahm Wilson, yesterday during the banquet kicking off the world's largest Spyder gathering, Spyderfest. Wilson, who is currently riding with more than 1,200 other Can-Am Spyder enthusiasts at Spyderfest 2015 inSpringfield, MO, joins a growing community of Spyder owners across the globe. "I'm an ex-motorcyclist, returning to riding after a few years away and I have been admiring the Can-Am Spyder for a while now," said Wilson. "With the introduction of the Spyder F3, I decided that was the bike for me, and it ended up being the 100,000th to come off the assembly line. I couldn't ask for anything more than to share this amazing experience with the Spyder community at Spyderfest!" "It has been a great ride with the Can-Am Spyder since we first unveiled it in 2007, to today, delivering the 100,000th unit," said José Boisjoli, BRP's president and chief executive officer. "The Spyder F3 model marks our entry in the cruiser segment, which represents about two-thirds of the North American motorcycle industry. Consumer response to this new model leads us to believe that we can expect more milestones in the near future." "The Spyder line-up delivers a thrilling ride with a feeling of complete freedom and confidence to owners, as evidenced by the growing Spyder rider community and record participation during this year's Spyderfest," said Len Damouth from Pit Bull Powersports, "Including those returning to open-air riding like Brahm Wilson. The opportunity to deliver this vehicle during Spyderfest is a bit like winning the lottery!"